US company, Heilind Electronics has signed a global distribution agreement with Harting Technology Group. 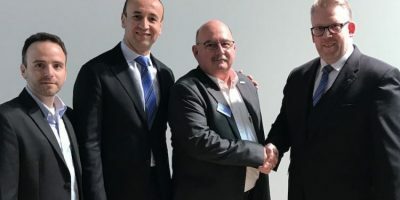 The two companies had already established a partnership in North America but now the distributor specialising in connectors and electromechanical components will represent Harting on a global scale. Commenting on the agreement, Edgar-Peter Düning, managing director of Harting Electric, said: “The new partnership will benefit customers: Heilind ensures rapid supply, technical support and an exceptional level of service”. “With this broadened distribution alliance, we are strengthening our international distribution network from our own branches and distribution partners, in order to help us meet our global revenue goals for 2020 and beyond” added Jon DeSouza, President and CEO of Harting Americas. “Our co-operation positions us even closer to customers and their requirements,” noted Alan Clapp, vice president at Heilind Electronics. The Harting Technology Group is one of the world’s leading providers of industrial connection technology for data, signal and power. It has 13 production plants and branches in 44 countries. The company also produces retail checkout systems, electromagnetic actuators for automotive and industrial use, charging equipment for electric vehicles, as well as hardware and software for customers and applications in automation technology, mechanical and plant engineering, robotics and transportation engineering. Heilind Electronics is one of the world’s leading distributors of connectivity, electromechanics and sensors. Headquartered in the United States with branches worldwide, Heilind claims to have the largest inventory of connector products in North America and is franchised for more than 170 of the electronics industry’s leading manufacturers. Heilind also maintains three well-equipped value added centres, in the USA, Germany and Hong Kong. The centres offer part assembly, part modification and part packaging services. They also offer a range of component modification and assembly services, including: kitting of components; assembly of connectors, fans, switches and relays; part modifications, from colour dying, custom marking or labelling, to pin extraction; and special labelling and packaging.